Monorail history has again been made in Japan. 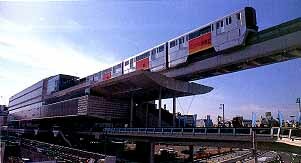 On November 27th of 1998 officials cut ribbon for the first section of the Tama Monorail. The new monorail was 5.4 kilometers long. 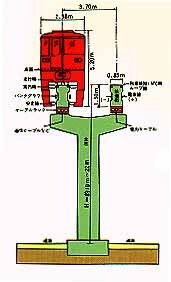 A second section (blue line on map below) opened January 10, 2000, bringing the system length to 16km. A commemorative postal stamp was issued in honor of the new system in 1998. Long range plans call for the system to eventually include an incredible 93 km of dual beam track! Above is a picture of a Hitachi Type 1000 monorail train arriving at Tachikawa-Kita Station.